Watch the video above or read about it below……. Surprises in the Oregon offense are fun for us, as fans, because they are delightful to discover, and they also allow us to ponder their future impact upon our beloved Ducks. 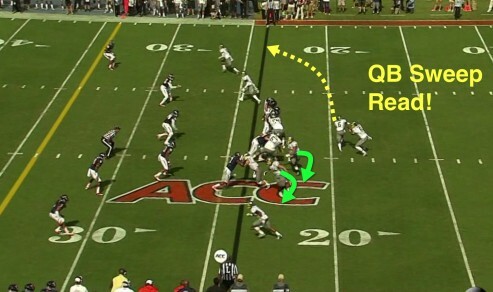 In this second game of 2013, we see three things of note: the return of a major play in the Oregon attack, the disappointment in the results of another foundation play for the Duck offense and an amusing twist seen but once in last year’s offense. For FishDuck.com, we are at an interesting point in offering analysis, as so much of what we see on the field has already been analyzed. We can now delve into the finer points of what makes a play successful. We have a superb example of that from the Virginia game, and it reminds me how much fun this season is going to be! Let’s look first at the “bad” of the Oregon offense yesterday, and I am not going to dwell on the obvious, our missing two 4th-down opportunities. The ESPN announcers Saturday were particularly lacking in analysis, as they called a “Zone Read” a “QB Fake” numerous times. We would not expect them to see the same nuances that we as readers of FishDuck.com have learned more than two years ago, such as our Straddled Triple Option play. Although we start with only two in the backfield (above), we see the slot receiver (yellow circle) going in motion to end up looping around and becoming the third option or pitch man. A familiar sight for Oregon fans . . . 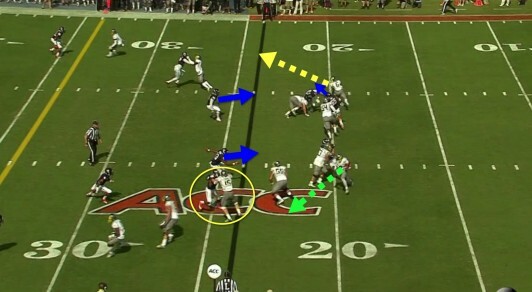 In the screenshot (above), it is apparent that Marcus believes that the outer two of the three options available are covered by the Virginia defense, hence he hands off to the RB (orange arrow) as the Inside Zone Read option. The Virginia defense was stout inside (above), as they had a strong push against our guards and center and stuffed the play for a small loss. This was common early on, as it seemed that the Cavaliers’ first priority was stopping the Ducks’ Inside Zone Read play, a sound defensive strategy against Oregon. This pattern continued throughout the day as Oregon never got untracked with one of the foundation plays of their offense, the Straddled Triple Option. While this to me was the “bad” of the day, it makes me eager to see how Oregon will overcome that challenge next week! 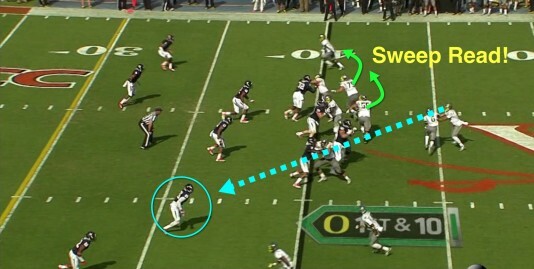 It is refreshing to look at one of the two basics plays of the Oregon offense in action again, as we see (above) the beginning of an Outside Zone Read. 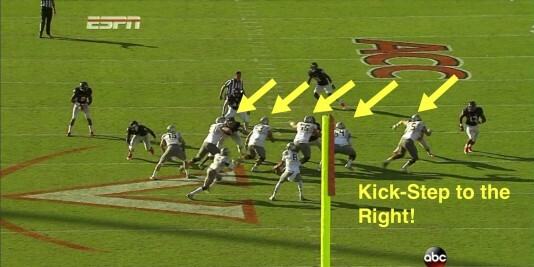 Our offensive linemen do their kick-step to the right to get the angle on the defenders. Over-reaction by defenses creates running lanes! After watching film of our shredding of Nicholls with the OZR, the perimeter defenders for the Cavs (above) are very conscious of stopping this play. Note how they are fighting to stay outside and not let us bounce to the corner, thus DAT finds a nice running lane inside between Hamani Stevens and Hroniss Grasu. 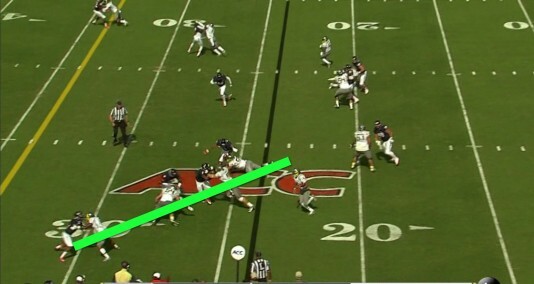 The green arrow is where Mana Greig is pancaking his blocking assignment, a linebacker. De’Anthony Thomas (No. 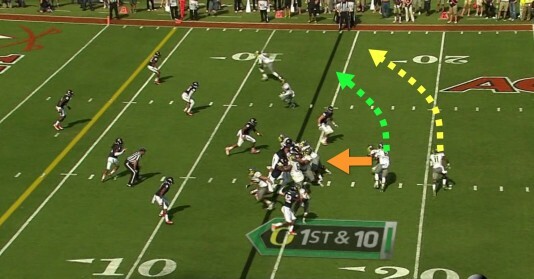 6 above) is headed outside behind the tremendous seal block by Jake Fisher (green arrow) and the downfield block of Bralon Addison (yellow circle), who is becoming a fan favorite with his big play ability and determined blocking for his teammates. 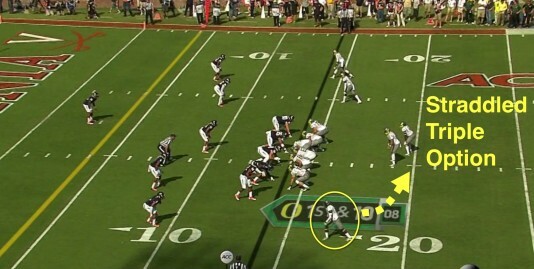 This game marked the re-emergence of a major play in the Oregon arsenal, the Sweep Read play that begins (above) with a usual formation that threatens the Bubble Screen at the bottom of the screen. Note how three Virginia defenders are spread out to cover that threat, thus it leaves fewer Cavs for the Ducks to block on the other side. 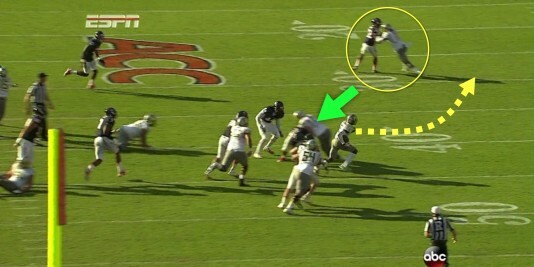 The difference with the Sweep Read (above) is how our offensive linemen are pulling (green arrows) to get outside. 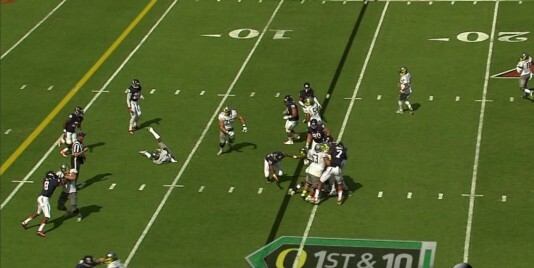 Note how Mariota is Zone Reading the linebacker (light blue dotted line), as the play begins. De’Anthony Thomas is turning the corner and Hroniss Grasu has launched out in front of the pursuing defensive linemen. Hroniss is lunging to lead ahead where DAT is going to be, thus pinning his defender inside. Then he will help Colt with the Cav he is assigned to. 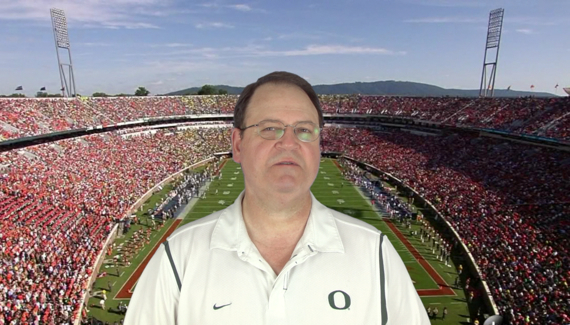 This screenshot (above) best epitomizes Oregon football. It is sacrifice, determination and speed by the entire offense. You see Bralon Addison hand fighting his defender to open an outside lane and Jake Fisher has the speed and mobility to be IN FRONT of DAT on a sweep? He is knocking over the little guy who got in his way. Meanwhile, Hroniss Grasu nailed the entire group, as he is at the bottom of the pile. Colt Lyerla plants his defender. Everybody sees the incredible speed and balance of DAT at the end of this touchdown, which IS a huge part of our success. Most do not see the skill and ferocity of our offensive linemen and receivers who make these opportunities happen for our running backs. You just want to go and hug these guys! What about the Twist I referred to? This one set me back, as it occurred early in the game. As we see above, a Sweep Read play, only flipping the backfield! Usually, as we just saw, the RB follows the pulling linemen but this time we see (above) the QB, Mariota, following the blocking of Grasu and Johnstone (green arrows). It’s an Inverted QB Sweep Read! Like the original Sweep Read, the success is predicated upon the superb blocking of the Tight End, Lyerla (yellow circle above). 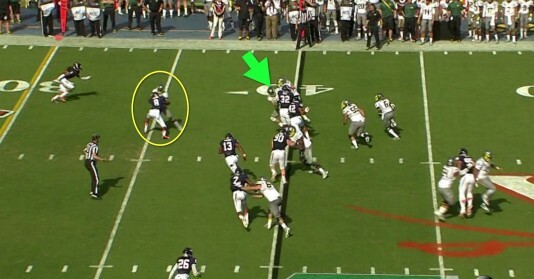 Note also how the Virginia defenders are keying on DAT, expecting to be following the RB! My friends, China may have the Great Wall, but the Oregon offensive linemen and receivers provide the GREEN WALL for the Ducks’ running attack. I have to imagine that running this unique play, so early on, really messed up the defensive “keys” that Virginia was watching for, hence creating some hesitation later in the game. THAT, my feathered friends, sniffs a lot like the game plans of the recent past and should give further comfort concerning the transition of the Oregon offense to Coaches Helfrich and Frost. We will see some superb plays this season, as the improvement in recruiting is becoming evident on the offensive line. We are seeing speed and agility up front for the Ducks that few teams possess, hence exciting touchdowns, such as the one above, will occur more frequently. Now that the NFL is utilizing the Zone Read attack, offensive linemen like ours will become coveted by the pros.